These muffins call for sourdough starter but the starter isn’t the leavening agent – baking soda is. The starter adds flavor and enough acidity to activate the baking soda. If you’re willing to get out of bed an hour early, you can whip these up on a school day. Just mix the dough the night before. It’s so much fun to watch them puff up on the griddle! Here’s the recipe, adapted from a post on The Fresh Loaf. Mix the starter, 2 cups of flour, and milk in a large bowl. Stir to combine, cover, and leave out for 8 hours or overnight. In the morning, add remaining flour, sugar, salt and baking soda and mix well. Turn onto a lightly floured surface and knead for 4-5 minutes. Roll out to 3/4 inches and cut into rounds with a biscuit cutter (or water glass). Roll out the scraps and cut more muffins from them. Dust a sheet pan or silpat mat with cornmeal, place muffins on the pan using a spatula, dust the tops with cornmeal and let rest for 45 minutes. Very lightly oil or butter a pancake griddle. Heat to medium-low and cook muffins for about 6-8 minutes on each side, or until browned on the top and bottom and cooked through. 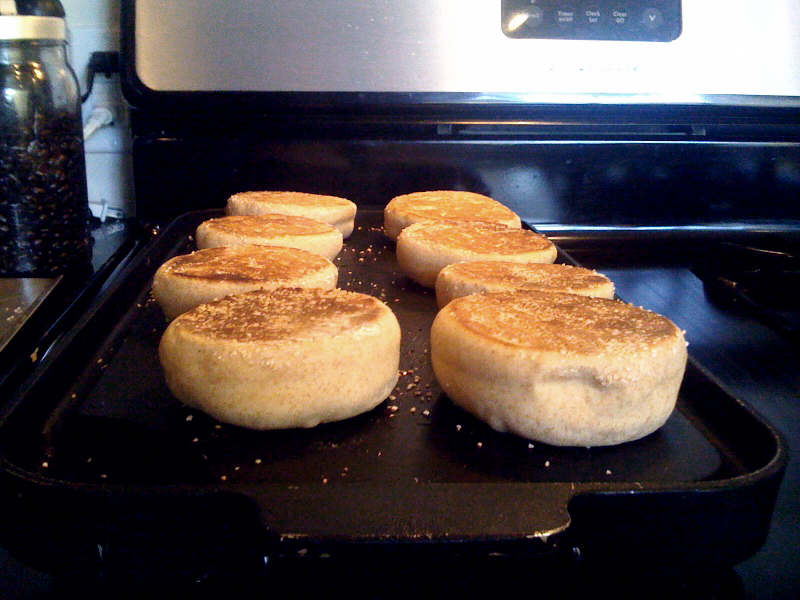 Notes: An over-greased griddle creates a crispy crust, which just isn’t quite right for an english muffin. This recipe should work with white flour, but you may need to adjust the amount of flour. Like store-bought muffins, these really must be toasted. Nursing a starter back to health.